South Korean youngster Kim Si-woo is hoping to make history at the PGA Tour's flagship tournament this spring. The 22-year-old is the reigning champion of The Players Championship. No player has successfully defended the prestigious title since the tournament began in 1974, and during a media event at the tournament's venue, TPC Sawgrass in Ponte Vedra Beach, Florida, Kim said he will look to change that. "Someone told me there hasn't been any back-to-back champion, and I've noticed a lot of champions who come back don't play well," Kim said on Monday (local time), according to the PGA Tour. "I would like to change that, and I'm already preparing to come back and defend my title this year," he added. "Coming back to this course (on Monday) has been so amazing. To see my pictures up on the wall and to drive up to this course, it brings back a lot of memories, and even though all tournaments are great, I would like to come back and win this one and defend my title." In May last year, Kim rallied from a two-shot deficit in the final round to win The Players Championship by three strokes, becoming the youngest winner in tournament history. He closed with a bogey-free round of three-under 69 to take the title at 10-under 278. Kim was the only player not to commit a bogey in the final round. It was Kim's second PGA Tour win, and made him just the second South Korean, after Choi Kyoung-ju in 2011, to win what's widely regarded as the "fifth major." 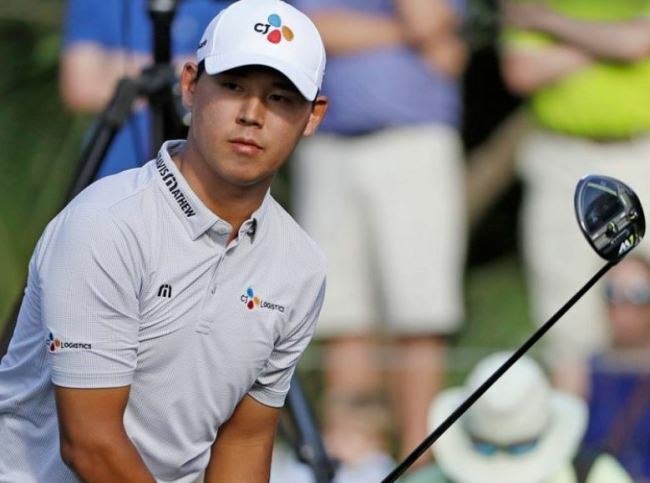 Kim said Choi, an eight-time PGA winner better known by his initials, K.J., called him to congratulate the young player immediately after last year's tournament. "It's such an honor and an amazing feeling to share that (win) with another Korean, and to have two Koreans win this tournament," Kim said. "Going forward, I hope to win more tournaments for Korea, and it's just been an honour to share that with K.J." So far in the 2017-2018 season, Kim has two top-10 finishes in 11 starts, and is 52nd on the FedEx Cup points standings. He hasn't cracked the top 30 in his last five tournaments, but he said he's at least pleased that a nagging back injury is now behind him. "I went back to Korea last winter, and I think just having the cold weather there didn't help," he said. "And I didn't really exercise or stretch as much as I should have, so looking back, I think that's what caused a lot of the injury. Now it feels great. I'm able to swing without any pain." Aside from trying to defend his Players Championship title, there is one other thing Kim is looking forward to: playing with Tiger Woods. The former world No. 1 and 14-time major champion, Woods set the golf world abuzz by tying for second place at Valspar Championship last weekend. Count Kim among those excited to see Tiger, a two-time Players champion, back in action. "I've been rooting for him to come back, and I've been supporting him, wanting him to win," Kim said. "To just see him out there practicing is just unreal because he's such a legendary player and I watched him growing up and watched him just dominate the sport. I'm hoping to play with him one day. I haven't played with him yet in a tournament, so I'm looking forward to that day."